Juzo is a world leader in the manufacturing of high-quality, medical grade compression garments. 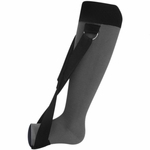 At HighTideHealth.com you will find the top lines of Juzo socks, stockings, orthopedic braces, and lymphedema arm sleeves. All Juzo garments are made with Lycra instead of Spandex used in many lesser brands. Lycra is the highest quality synthetic compression fiber on the market. Juzo's FiberSoft process wraps each compression fiber with soft, protective threads. All Juzo garments are Latex free which also adds to their wearing comfortable and longetivity. Juzo Compression garments are offered in a range of compression from 8-12 mmHg, 15-20 mmHg, 20-30 mmHg and 30-40 mmHg. Juzo precise fitting charts ensure that your garments will fit correctly when properly measure.